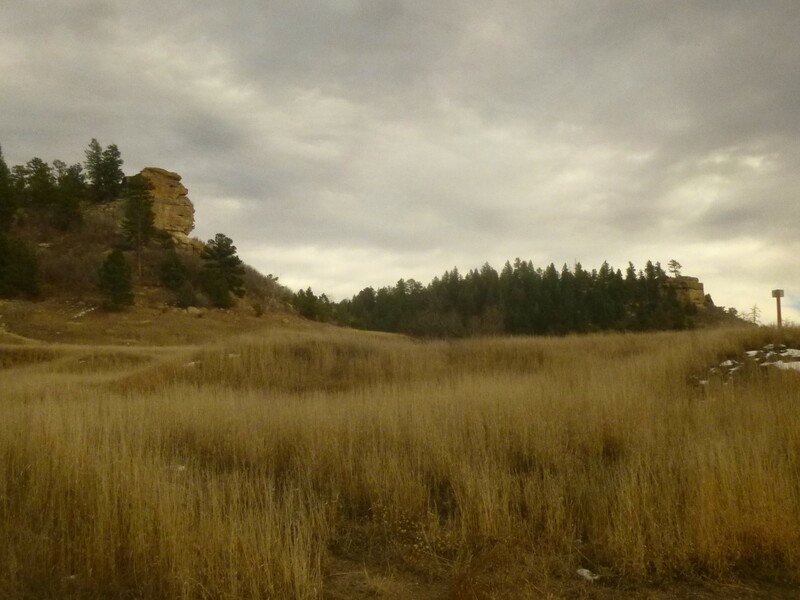 The downhill journey through Castlewood Canyon begins at the Canyon Point parking area situated at the terminus of the park drive, about six miles south of Franktown along Highway 83. 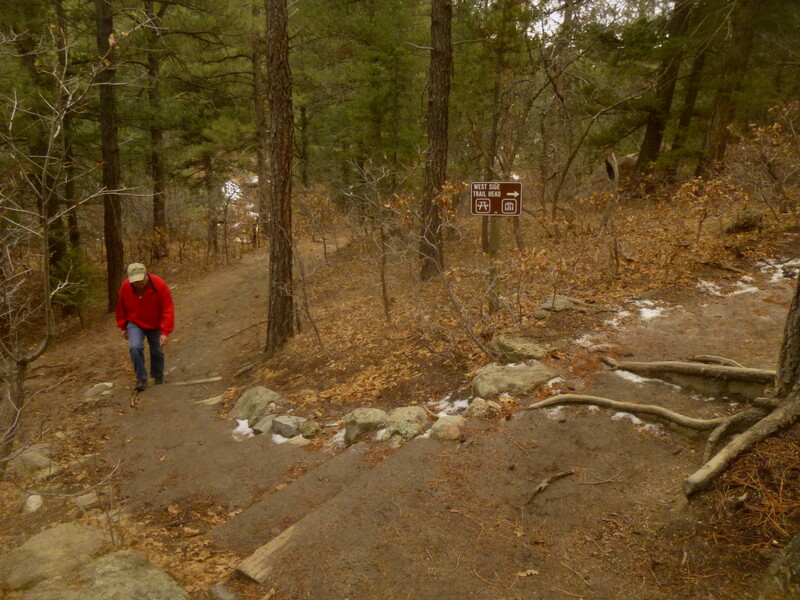 There are really two choices of trails heading northwest: the Inner Canyon Trail (marked “K” on the state park map), which descends steeply into Castlewood Canyon before following Cherry Creek for nearly a mile en route to the dubious old dam; or the Lake Gulch Trail (route “L” on the map), a higher-elevation, gently-sloping route that joins with the weaving Inner Canyon Trail 1/3 mile short of the dam. On the November afternoon my father and I hiked this route, we chose the latter, as I had just completed the Inner Canyon Trail hours prior. If planning to take the Inner Canyon Trail instead of Lake Gulch, add 1/10 mile to the total distance – making it 3.3 miles one-way to Lucas Homestead. The Lake Gulch Trail, paved for its first 1/5 mile, begins to drop into the gulch just past the Pikes Peak amphitheater, which affords tremendous views of the namesake peak. Though not particularly steep, the well-marked trail loses about 200 feet as it skirts around a colorful bluff. 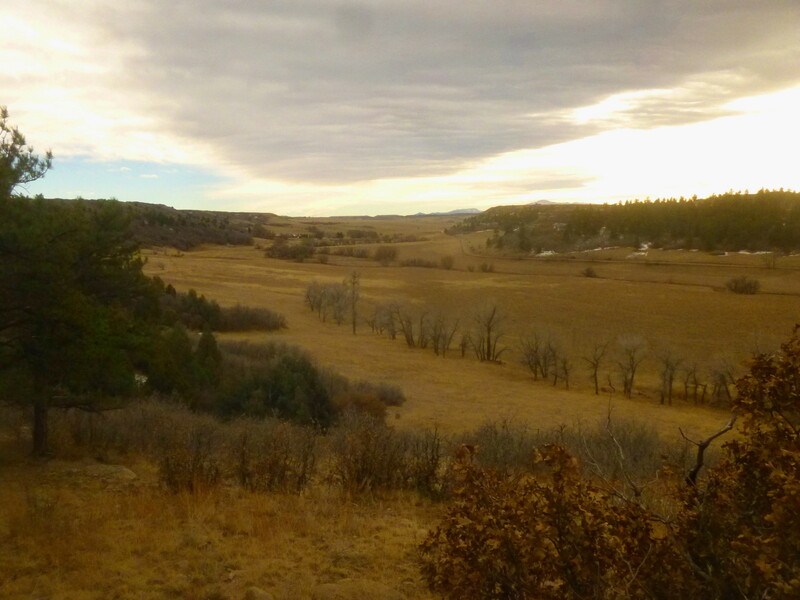 The meadow off to the left (Lake Gulch) was once filled with water – a reservoir formed by the construction of the Castlewood Canyon Dam in 1890. That is, of course, until the fateful summer thunderstorm of August 1933. 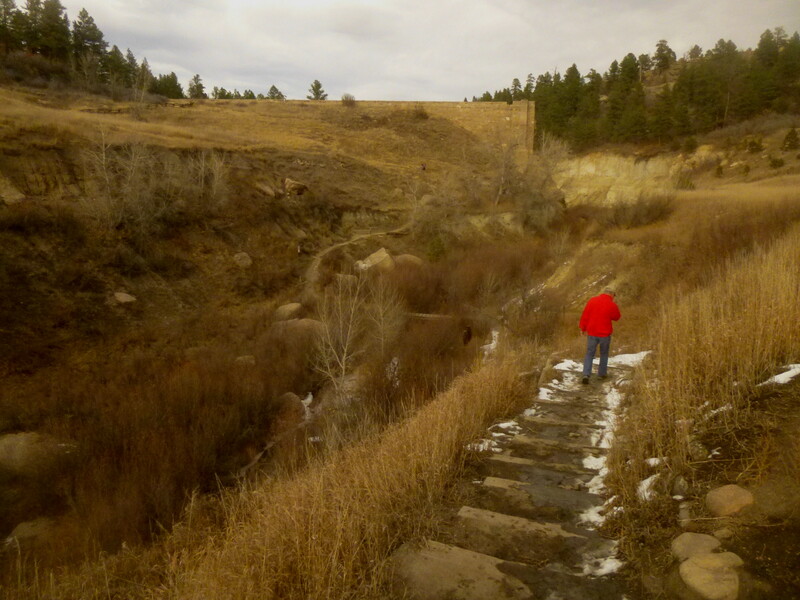 At 9/10 mile, hikers on the Lake Gulch Trail will encounter perhaps the hike’s most significant obstacle (besides the persistent mud after a snow or rainstorm): a precarious creek crossing that can be a tad harrowing in wet weather. 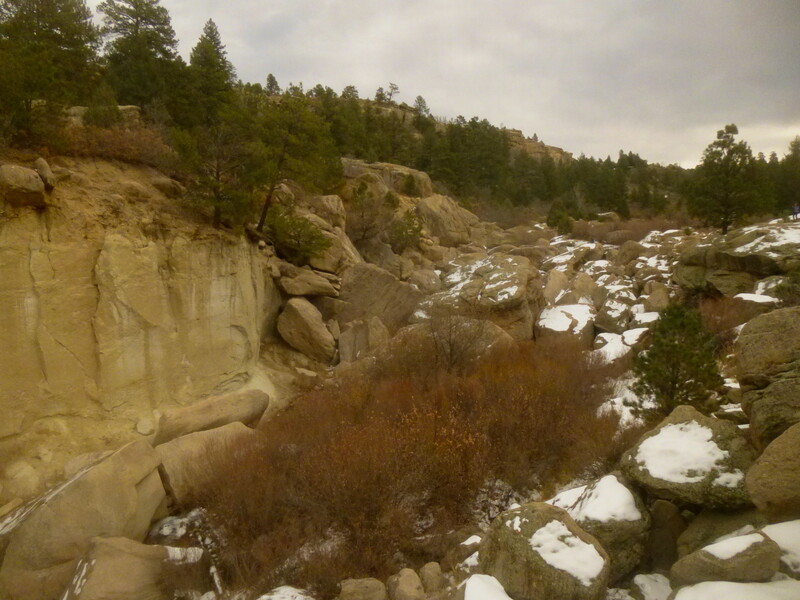 Fortunately, the Castlewood Canyon trail crew has kindly left a wire-encased collection of pebbles that forms a sort of rectangular bridge between two large, slippery boulders. 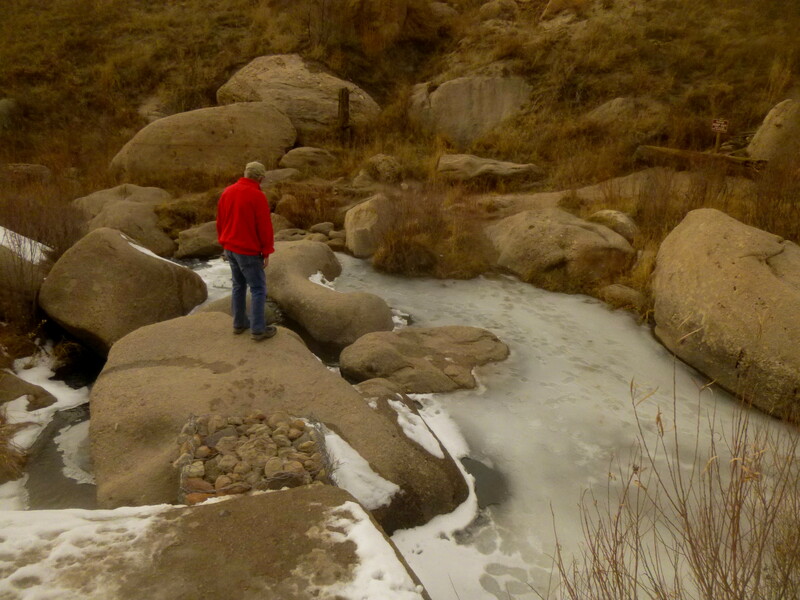 Still, the frozen waters of Cherry Creek on the November afternoon I visited made me a little uneasy. 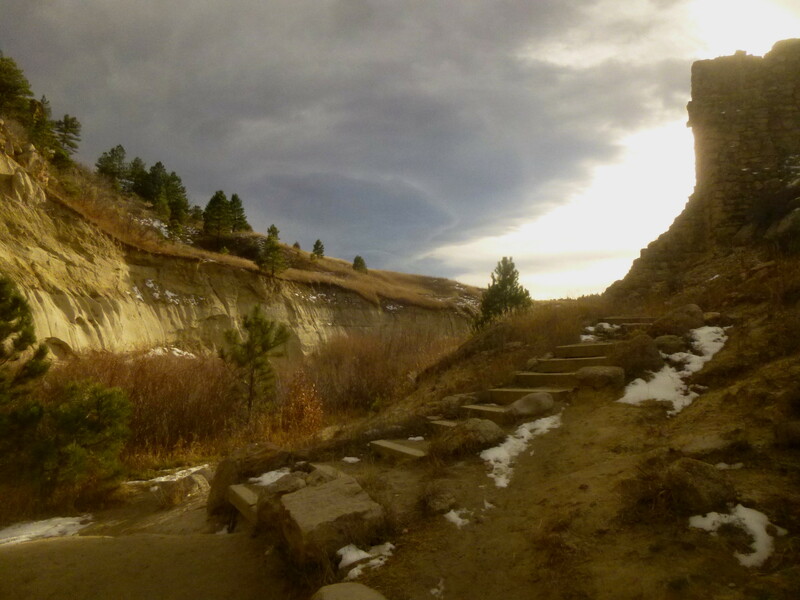 Just steps beyond the bridge, the trail joins with the Inner Canyon Trail running roughly east-west through Castlewood Canyon. 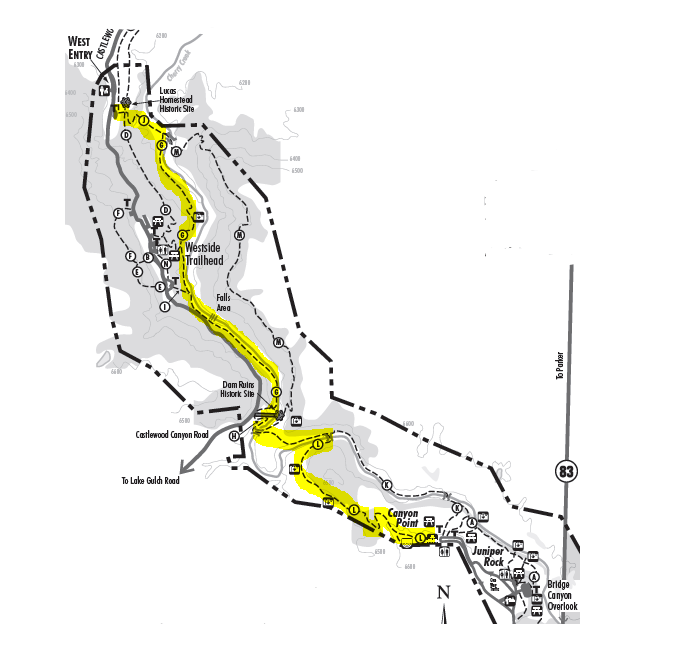 Head right to complete the 1.8-mile loop back to Canyon Point, or continue left up a short series of steps marked “Dam Trail” for access to the lower canyon. From here it is 1/5 mile across sandy grasslands to the junction with the Rimrock Trail (marked “M” on the map), a 2.2-mile jaunt that also leads down-canyon to Lucas Homestead but is slightly longer than the route described here. Our hike brought us 1/10 mile further down the Dam Trail to the start of the Canyon Bottom Trail, which begins just after crossing another bridge over Cherry Creek. From this spot, it’s hard to miss the towering stone structure on the left bank immediately up ahead. 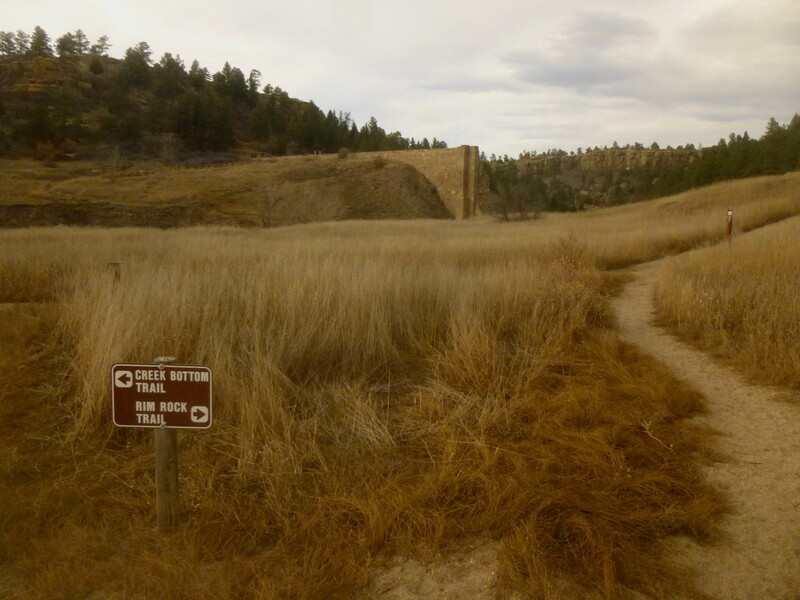 The Castlewood Dam will never, in the life of any person now living or in generations to come, break to an extent that will do any great damage either to itself or others from the volume of water impounded, and never in all time to the city of Denver. Before the dam broke, the area now encompassing the first 1/10 mile of the Canyon Bottom Trail was underwater. Today, the route can be mired in mud from a combination of snow melt and the creek bed, which parallels the path immediately on the right. Coming from the eastern section of the park, hikers will notice that the Canyon Bottom Trail has entered into a different, older layer of rock as it skirts the lower gorge. The chalky, butterscotch-colored sandstone in this area is called Dawson Arkose, the third major rock formation found in the park (for the two others, see my Inner Canyon trail description). A closer look may reveal bits of petrified wood, as well as fossils, cemented into the Dawson formation. After about 1/4 mile hugging the banks of Cherry Creek, the stream veers off to the right and the trail passes through a flat, grassy section boasting a couple of small aspen groves. 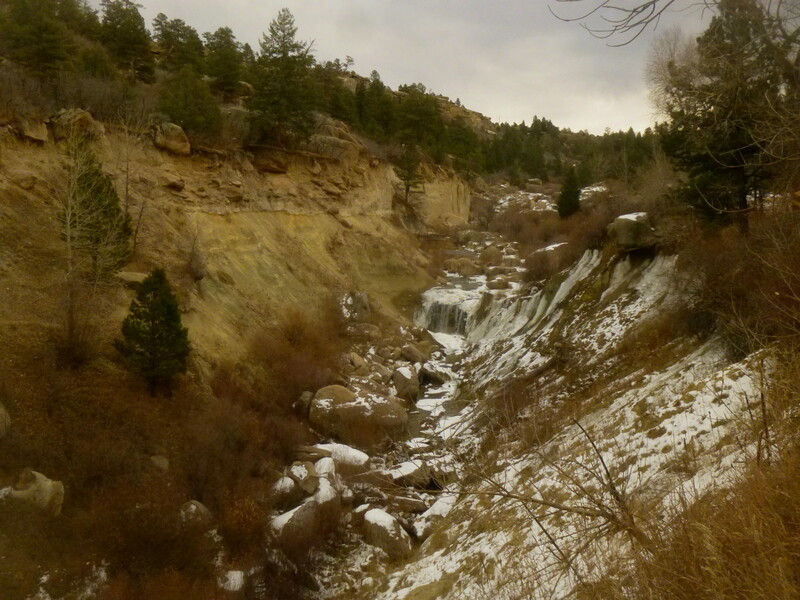 It is another 1/3 mile or so to the “falls,” really a small cascade not easily accessible from the Canyon Bottom path. There is, however, an impressive boulder field sure to be a favorite among eager young kids, as well as a decent viewpoint 1/5 mile past the rock field. From here, the petite cascades can be seen from a distance. 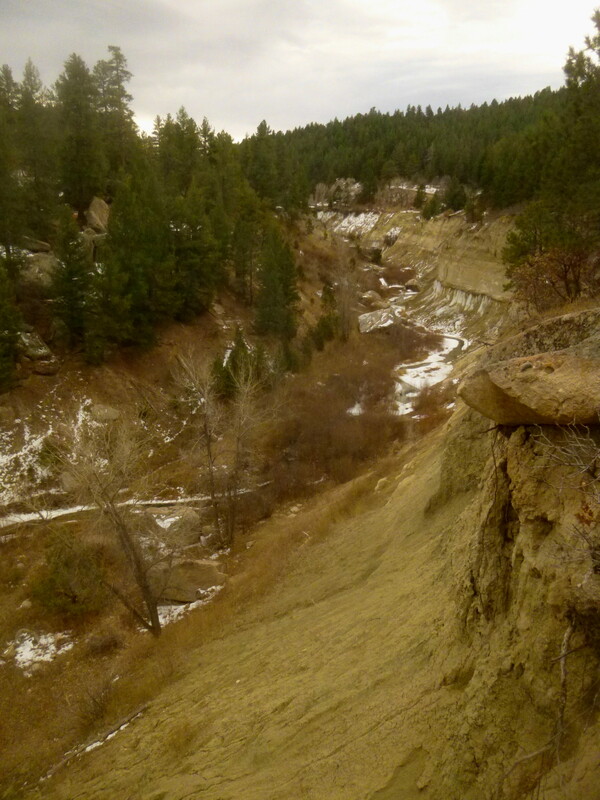 Around the next landmark – the junction with the Falls Spur Trail (trail “I” on the map) – the canyon bottom is now some 30 feet below the trail; wooden railings have been installed to preclude an unfortunate fall. 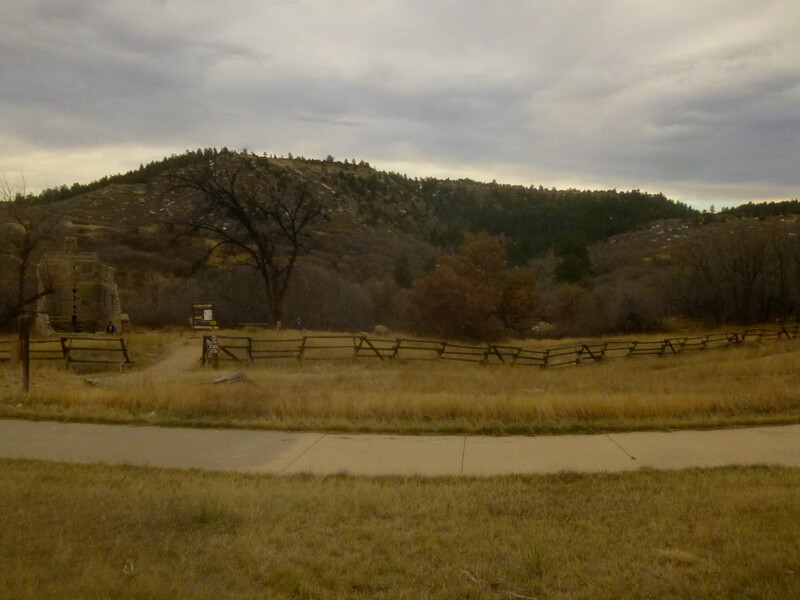 The shaded path between here and the next junction (another spur heading to Westside Trailhead on Castlewood Canyon Rd.) weaves through a collection of ponderosa pines characteristic of this region of Colorado, known as the “Black Forest.” The route dips in and out of a series of gulches before reemerging from the woods into a habitat more akin to montane shrublands. The dramatic Dawson formations are eventually replaced by more gently-sloping, shrub-covered hillsides signaling the beginning of the end of the canyon. 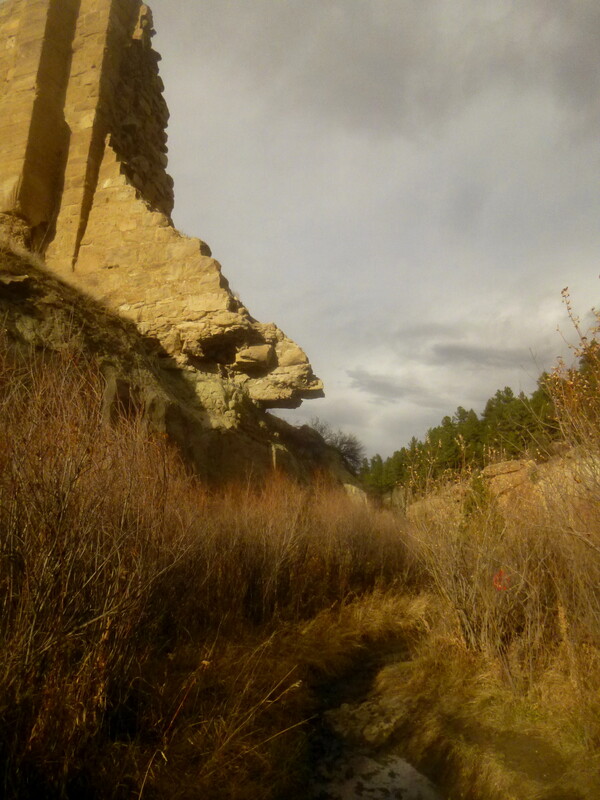 Peering across the creek, you will begin to see the end of the Castle Rock conglomerate high tops – it is here that the Rimrock Trail begins winding down a slope to meet the Canyon Bottom. 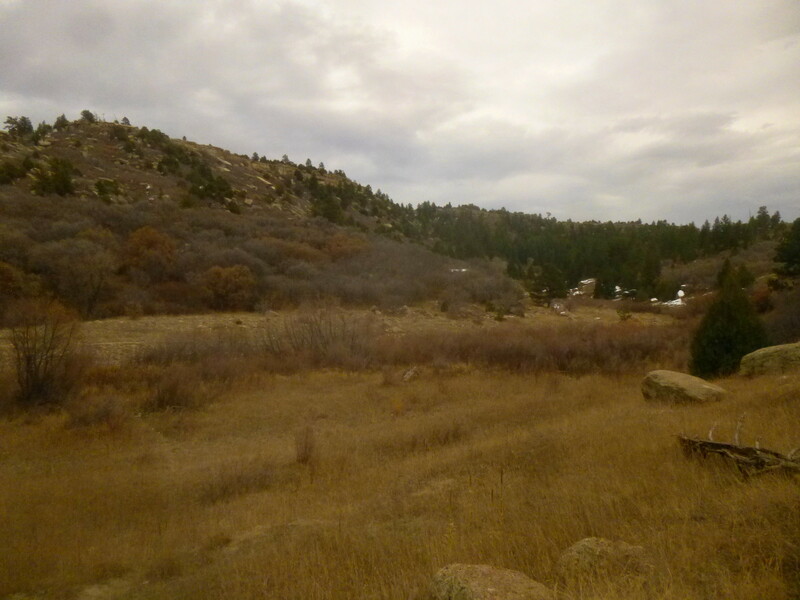 The two trails meet on the edge of a colorful meadow – the trail beyond again changes name: the Homestead Trail. This is the final stretch: the Homestead Trail climbs – at first gently, then up a brief but steeper switchbacking slope – for 1/3 mile up to Patrick and Margaret Lucas’ old home (which, due to the curve of the canyon, evaded the 1933 flood). Wooden signs appear on the left and right of the trail, marking sites associated with the 1894 homestead (stables, etc.). On the day we reached the parking lot at the Lucas Homestead, there were no more self-guided hike pamphlets remaining – perhaps a task for another day. 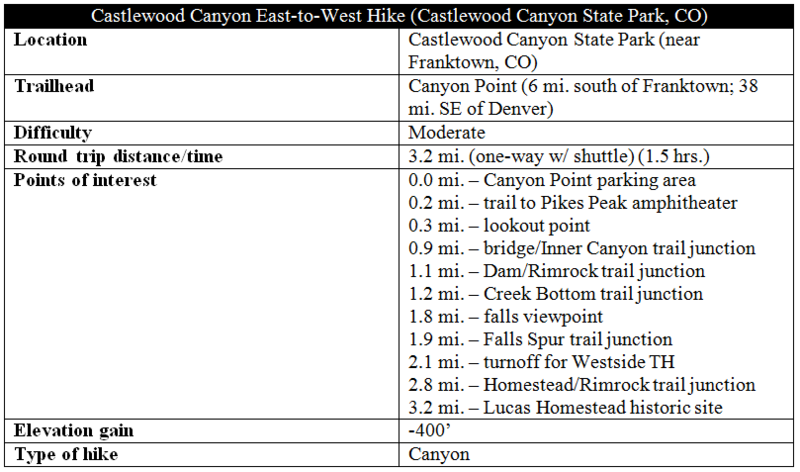 For today, we savor in the satisfaction of having hiked nearly the length of Castlewood Canyon. 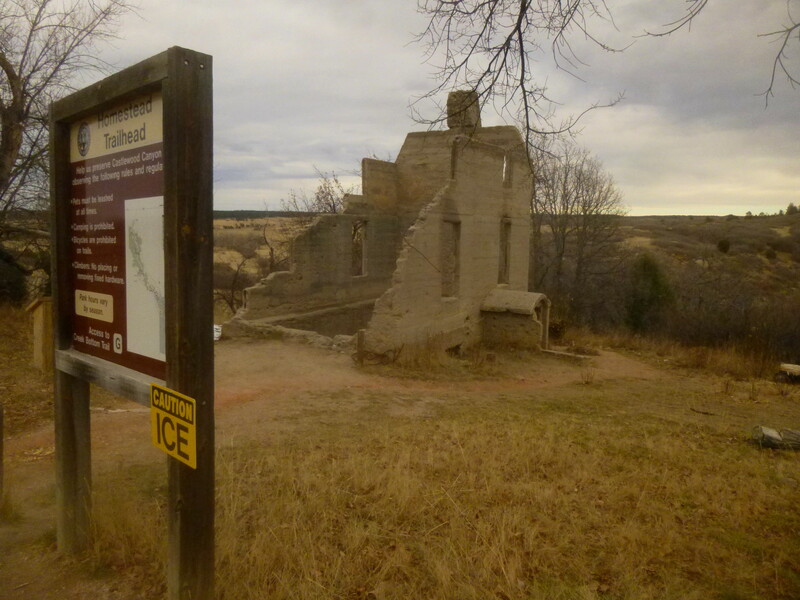 This entry was posted in Colorado, Colorado State Parks, Moderate Hikes and tagged 1933 flood, canyon, Canyon Bottom Trail, Castlewood Canyon, Castlewood Canyon State Park, Castlewood Dam, Cherry Creek, Colorado, Denver, Homestead Trail, Lake Gulch Trail, Lucas Homestead, waterfall. Bookmark the permalink.